When you know how to write an email well, you can save time and get more business done with your employees, clients, vendors, and partners. I’m not talking about writing an email to your spouse about a rental for next summer’s vacation (an informal, personal email.) Nor am I referring to writing an email newsletter (an e-zine to your organization’s partners and supporters with stories and announcements) – although these tips can apply to these kinds of emails, too. 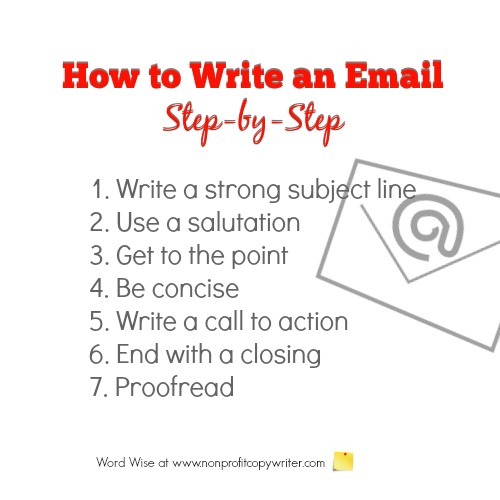 These 7 email writing tips can help. State the purpose of your email in the subject line. Be specific. Rather than simply, “Thank you,” write, “Thank you for your time on Thursday.” Specificity moves your reader to open the email. Generalities lead the reader to skip it as spam. A strong subject line also allows your reader to find your email easily in her saved folder if she needs to refer to its content once again. (Get a free downloadable checklist for writing better email subject lines). You’re writing to a person, so be sure to use a greeting to begin the conversation (“Dear Dr. Smith,” or “Joe,”) – even if your email is short or a reply. Use the reader’s name. If you don’t know the person’s name, use his title (“Dear Director of Advancement”). People read emails quickly, much as they do with websites and social media. When content is long, they skim. (I know I do.) Make it easy for them to read quickly and skim. Use short sentences, short paragraphs, and bullet points. Include plenty of white space. Use a simple, clear font; avoid bold, italicized content. Emoticons? No – not when you’re trying to get business done. What do you want your reader to do as a result of your email? Ask for it, whether it is to send files, get an interview, respond at her earliest convenience, or understand that you’ll follow up in a few days. It’s polite to thank your reader respectfully; manners foster a good relationship. Then it’s time to sign your email. “Best regards” and “Sincerely” are professional. Include your name and then your email signature with contact information so that your reader knows who you are and can respond. But don’t click send just yet! Before you click send, review your content to see that you’ve stated your purpose clearly and that you’ve indicated the action you’d like the reader to take. Check your spelling, grammar, and punctuation.